Vol 1 | Issue 1 | July – Dec 2016 | Page 29-35 | Akshay Gadiya, Mandar Borde, Priyank Patel, Shekhar Bhojraj, Premik Nagad, Tanay Prabhoo. Authors: Akshay Gadiya , Mandar Borde , Priyank Patel , Shekhar Bhojraj , Premik Nagad , Tanay Prabhoo . The Spine Clinic, Lilavati Hospital and Research Centre, Bandra West, Mumbai, India..
Lumbar prolapsed intervertebral disc (PID) or herniations is the most common cause of spine related disability in working-age individuals. Symptomatic prolapsed disc presents as lumbar radiculopathy due to both mechanical compression as well as chemical irritation of nerve root. It is common problem encountered in both surgical and non-surgical practice. There is variety of non- surgical as well as surgical treatment available for treating this common ailment. Though various protocols are available to promote improved outcome and cost effectiveness and reduce unnecessary interventions the decision between surgical and non-surgical management of this entity can be challenging to both patient and treating physician. The aim of this article is to discuss the etiology and pathophysiology of lumbar PID and provide a practical and evidence based algorithm for its treatment. Lumbar PID can be extremely painful and cause significant morbidity and loss of function [1,2]. It can lead to substantial radicular symptoms, which if persistent can lead to surgical intervention. Intervertebral disc in lumbar spine are complex structures that are subjected to significant axial loading along with shearing forces. Because of these biomechanical demands along with the inability to remodel owing to avascular nature, herniations of lumbar intervertebral discs are common. The armamentarium of treatment for this pathology extends from simple conservative treatment of complete bed rest to highly complex percutaneous endoscopic microdiscectomy. Indirect cost associated with this condition may include work absenteeism, short and long term disability and reduced work capacity secondary to pain and/or weakness. Fortunately 90% of cases of sciatica from herniated lumbar disc resolve in about 12 weeks. In the absence of progressive neurological deficits or cauda equina syndrome, non-surgical treatments are implemented for 6 weeks with good results. Conservative treatment is recommended to reduce pain and improve function in this time period while the body hopefully will resorb the disc material. Surgical treatment is indicated in scenario of worsening neurological deficit, cauda equina syndrome and failure of conservative treatment. Intervertebral disc is composed of cartilaginous end plates, the annulus fibrosus (AF), and the nucleus pulposus (NP). The end plates are intermittent structures between the subchondral bone of vertebral body and the AF of intervertebral disc. The end plates are made up of 1-mm thick layer of hyaline cartilage, which is comprised of 50% water, chondrocytes, proteoglycans (PGs), and type II collagen . An extensive capillary network exists in end plate that extends one to two millimeters in AF. This vascular network is responsible for providing nutrition to the otherwise avascular intervertebral disc. AF forms the outer ring of intervertebral disc forming 15-25 lamellar rings and is composed primarily of fibroblast like cells and type 1 collagen fibers*. It is commonly divided into outer and inner AF . The outer layer is highly organized and almost exclusively made of type I collagen, resulting in high tensile strength. Comparatively the inner layer is a transitional zone between the AF and NP and has both type I and type II collagen, as well as multiple different proteoglycans. NP is the central jelly like substance composed primarily of chondrocyte like cells that are responsible for secreting type II collagen as well as numerous PGs. Aggrecan is the most common PG in NP and is responsible for its substantial hydrophilic nature. NP is responsible for the ability of IVD to withstand the substantial axial loads. Recently notochordal cells have been identified in the NP that is responsible for preventing the apoptosis of chondrocyte like cells . While often times the terms disc herniation, disc protrusion, and disc bulge are used interchangeably in the literature, according to the combined task forces of the North American Spine Society, the American Society of Spine Radiology, and the American Society of Neuroradiology, these pathologies are not the same; they define a disc herniation as “localized or focal displacement of disc material beyond the limits of the intervertebral disc space”. This differentiation is critical, as diffuse enlargement of annulus cannot be labeled as true herniation as it is a variant of disc degeneration. A true herniated disc is a focal pathology that affects less than 25% of the intervertebral disc. Herniated discs can be categorized as protrusions, extrusions, or sequestrations (Fig. 1). Protrusions are wide-based herniations in which the diameter at the base of the herniation is wider than the diameter of the herniation in the canal. Extrusions have a narrow base, with a large herniation in the canal, and sequestrations are herniations in which there is no continuity between the herniation and the remaining intervertebral disc. Figure 1: Types of lumbar disc herniation. 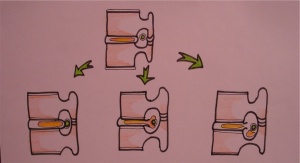 Protrusion (A), Extrusion (B) and Sequestration (C). Extensive research has been performed into epidemiology of lumbar disc herniations till date and many possible risk factors have been identified. Cummins et al.reported that the average age of patients with a herniated disc was 41 years, and the diagnosis was slightly more common in males than females (57% versus 43%, respectively). Obesity is a major comorbidity associated with lumbar disc herniations. An elevated body mass index (BMI) thought to increase the axial load on lumbar spine resulting in herniated intervertebral disc. Bostman reported 27% of the patients undergoing surgery for a lumbar disc herniation were obese, whereas the population prevalence of obesity in Finland at that time was only 16%. A recent meta-analysis by Shiri et al. found that overweight patients (BMI: 25–30) and obese patients (BMI > 30) had a statistically significant increase risk of being diagnosed with lumbar radiculopathy than patients with a BMI < 25. Other medical comorbidities such as diabetes, hyperlipidemia, and smoking have also been reported as possible risk factors for lumbar disc herniations. Sakellaridis compared a case series of 102 patients requiring surgical intervention for a lumbar disc herniation to 98 patients undergoing elective surgery for another pathology and found a statically significant increase in the rate of diabetes in patients undergoing a lumbar microdiscectomy (32% versus 19%, p = 0.001). Also Mobbs et al. reported that the need for revision surgery for diabetic patients was 7 times higher than non- diabetic patients. In a meta-analysis of 49 articles, Jordan et al. identified smoking as an independent risk factor for lumbar disc herniations. Although the mechanism by which this comorbidities increase the rate of lumbar disc herniations is yet to be proven it is speculated that there is either decrease in microcirculation or increase in cytokine expression. Occupational risk factors have been demonstrated as a major risk factor for lumbar disc herniations as this pathology is more common in working age individuals. Cummins et al. reported that 20% of the patients with lumbar disc herniation had a workers’ compensation claim, compared to only 8% of patients with spinal stenosis and 7% of the patients with a degenerative spondylolisthesis. In a multi-center, case–control study, Seidler et al. found a dose–response relationship between the total work-related lumbar load and the incidence of lumbar disc herniations. Multiple biomechanical studies have demonstrated that the combination of an axial load and twisting mechanism or an axial load and a flexion mechanism can lead to a herniated disc. Finally, there is a clear genetic link established for lumbar disc herniations and lumbar disc degenerations. Zhang et al., in a case control study of 4000 patients, reported that a family history of a lumbar disc herniation was the most important risk factor in predicting patients who would develop a lumbar disc herniation (odds ratio 3.6). Although this etiology is multifactorial, the collagen IX tryptophan allele (Trp2) has been linked to an increased severity of disc degeneration in patients less than 40 years of age with a lumbar disc herniation. While a herniated disc is traditionally thought of as a herniation of the NP through the AF, histologic examination of surgical specimens has shown that a pure herniation of NP is rare. The annulus makes up a portion of the herniation in two-thirds of the cases, and approximately 20% of all herniations include a portion of the cartilaginous endplate. Lumbar disc herniations are most commonly posterolateral herniations that affect the traversing nerve root, and pain may either be from mechanical compression or chemical irritation of the nerve root. Mechanical compression can deform and stretch the nerve, as well as compress the microcirculation leading to ischemia and radicular symptoms; additionally, the herniation stimulates a substantial inflammatory cascade that is critical in the resorption of the disc herniation, but it can also lead to chemical irritation of the nerve root and radicular symptoms. While the increase of number of cytokines have been described after lumbar disc herniations, the role of only few have cytokines on disc resorption and radicular symptoms have been established. The concentration of FGF is elevated in surgical specimens of human lumbar disc herniations, and this cytokine potently attracts macrophages to the injury site. While the inflammatory cascade is beneficial because it leads to resorption of the herniated discs, it also is partly responsible for the symptoms from a herniated disc. While there is little innervation to uninjured intervertebral discs, after being exposed to the inflammatory cascade, up to 80% of disc herniations have nerves present after being surgically removed. Additionally, there is a significant increase in the concentration of TNF alpha in lumbar disc herniations compared to intact intervertebral discs, and TNF alpha has been repeatedly demonstrated to stimulate radiculitis. The decision to treat any condition depends upon an understanding of the natural history of the disease process. The natural history of a lumbar herniation of the nucleus pulposus (HNP) is not fully known and clear indications for operative intervention cannot be established from the literature. Controversy still exists regarding indications for operating on large, extruded discs. A large extruded disc has been a relative indication for operative treatment in the past. However, several papers have demonstrated that these discs have the greatest tendency to decrease in size with conservative management[4,27]. The Spine Patient Outcomes Research Trial (SPORT) recruited 501 surgical candidates and randomized them into discectomy versus conservative treatment. At 2-year follow-up, both groups had made substantial improvement. There was a tendency towards better outcomes in the operative group but this was not statistically significant. A large crossover of patients between the groups hampered the study. In a quest to identify the natural history of massive herniated discs, Benson et al. retrospectively studied 34 patients over a period of 7 years. They concluded that where clinical progress is evident, 83 % cases of massive disc herniation will have sustained improvement and it is safe to adopt ‘wait and watch’ policy in cases of massive disc herniation if there is early sign of clinical recovery. As described in a previous section, more than 80 % cases with lumbar disc herniations have favourable outcome when left untreated. This fact underlines the role of non-operative treatment in the management of lumbar disc herniations. Conservative treatment is recommended to reduce pain and improve function in this time period while the body hopefully will resorb the disc material. Several conservative options exist, but the data is unclear as to which are truly efficacious. Numerous medications, including acetaminophen, non- steroidal anti-inflammatory drugs (NSAIDs), muscle relaxants, steroids, narcotics, neuroleptics, and anti-depressants, are used to treat back pain and radicular symptoms that result from lumbar disc herniation. NSIADs are often utilized as a first-line treatment, but there is limited data supporting their benefit. Oral corticosteroids are also commonly prescribed for acute disc herniations and lower back pain, but data regarding their efficacy is limited. Membrane-stabilizing agents such as gabapentin and pregabalin show modest benefit. Spinal Manipulative therapy (SMT) is another mode of non-operative treatment used by Osteopathic physicians, chiropractors and physical therapists. Quality studies on the efficacy of SMT in the treatment of symptomatic lumbar herniated discs are lacking. Recent review is unable to make strong recommendations for or against its use in low-back and radicular pain due to poor quality evidence. The use of epidural steroids for treatment of sciatica was first documented in 1952. Since then the use of epidural steroid injections for treatment of symptomatic lumbar disc herniations has increased exponentially and has become a commonplace in treatment of symptomatic lumbar disc herniations. The use of fluoroscopy has allowed for more accurate and safe placement of injectate in epidural space. Saal  first demonstrated the rational explanation for use of corticosteroids in 1990. He demonstrated the elevated levels of Phospholipase A2 at the interference between herniated nucleus pulposus and nerve root. There are 3 techniques for injection in to epidural space namely caudal approach, interlaminar approach and the transforaminal approach. The discussion on details of techniques is beyond the scope of this article. However, transforaminal approach is used most frequently. Schaufele et al. compared transforaminal to interlaminar epidural injections for lumbar disc herniation and found that the transforaminal injection group had greater improvement than the interlaminar group. In our practice, we prescribe complete bed rest for a period of 2 weeks. We believe off loading the spine help in early resolution of acute symptoms. We have also experienced that a short course of intravenous methyl prednisolone at 1g/day for 3 days help to reduce chemical radiculitis occurring because of herniated disc. After 2 weeks patient is asked to mobilize out of bed and undergo a systematic physiotherapy program for another 3 weeks. Patient is asked to assess the claudication and to keep a watch for ‘red flag’ signs. In case any of latter things occur or the claudication distance is progressively decreasing, the patient follows up immediately and is evaluated for surgical management (Fig.2). Patients who are not significantly better symptomatically at the end of 2 weeks after complete bed rest are also the candidates for surgical management. The absolute indications for surgical treatment in patients with lumbar disc herniations are worsening neurological deficit and cauda equina syndrome. Latter is a surgical emergency and is characterized by perianal sensory deficit, bowel and bladder incontinence and either a new or progressive deficit. More often the herniations are central and presents more frequently in men in the fifth decade of life. It is commonly found in L4-L5 disc . Relative indications for surgical treatment vary and are surgeon as well as patient dependent. There are certain prerequisites that we follow before deciding on surgical treatment. Patient should have demonstrable pathology on radiology and correlative physical examination in displaying motor and sensory symptomatology in addition to failure of non-operative treatment. Operative treatment for lumbar disc herniations include endoscopic microdiscectomy, micro lumbar discectomy, interlaminar discectomy with or without foraminotomy, conventional open laminectomy and discectomy with or without instrumented fusion and disc replacement. Whatever surgical option being chosen, the aim of surgery should be thorough decompression of nerve roots. It has been always the matter of debate regarding amount of disc to be removed during discectomy. Spengler, in 1990 in a case control study concluded that results of radical discectomy were comparable to limited discectomy. Conventional open laminectomy and discectomy is preferred in patients with co existent lumbar canal stenosis. Another important question to address is to do fusion or not do fusion along with decompression as the there are advocates for both the lines of treatment in literature. Proponents of fusion describe discectomy as the destabilizing procedure and thus fusion is required to stabilize the spine. However, the other school of thought believes in just adequate lumbar decompression. We belong to the second group and do not believe in prophylactic fusion. Frymoyer et al. in 1978 gave the guidelines for fusion in lumbar disc herniation surgeries. Fusion was indicated in patients with acute disc herniations and protracted significant component of back pain, symptomatic and radiologically demonstrable segmental instability and presence of neural arch defects along with disc disease. Pedicle screw fixation along with intertransverse posterolateral (PLF) fusion is the modality of fusion preferred in our unit whenever we fuse the cases of lumbar disc herniations. Interbody fusion is performed only in cases having lumbar disc herniations along with reducible lytic listhesis at the same level. In a recently published study by Glassmann et al., transforaminal lumbar interbody fusion (TLIF) fared better than PLF in patients of spondylolisthesis. While in other pathologies TLIF and PLF had same functional outcome. Advantage of PLF over TLIF is less surgical time and less blood loss..
To conclude, lumbar disc herniations are major cause of lower back-related disability in working-age group. Fortunately, around 80 % of patients do well with non-operative treatment while surgery is reserved for a small and specific fraction of patients. There is a wide range of modalities in non-operative management of lumbar disc herniations inspite of lack of evidence for any specific modality better than other. In cases of clinico radiological mismatch epidural steroids is preferred modality of treatment. Whenever an operative treatment is opted we don’t believe in prophylactic fusion. Instability should be given a chance. Fusion is performed only in limited and specific patients. Pedicle screws fixation along with posterolateral fusion (PLF) is a preferred modality of treatment. 1. Shroeder G, Guyre C, Vaccaro A. The epidemiology and pathophysiology of lumbar disc herniations. Semin. Spine Surgery. 2016;28 : 2-7. 2. Simon J, Conliffe T, Kitei P. Non operative managemet: An evidence based approach. Semin. Spine Surgery.2016;28: 8-13. 4. Saal JA, Saal JS. 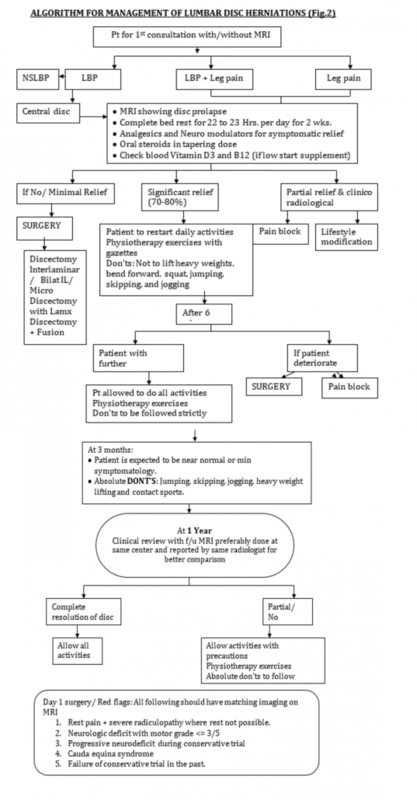 Nonoperative treatment of herniated lumbar intervertebral disc with radiculopathy. An outcome study. Spine. 1989;14(4):431–437. 5. Colombier P, Clouet J, Hamel O, Lescaudron L, Guicheux J. The lumbar intervertebral disc: from embryonic development to degeneration. Joint Bone Spine. 2014;81(2):125–129. 6. Roberts S, Menage J, Urban JP. Biochemical And Structural Properties Of The Cartilage End-Plate And Its Relation To The Intervertebral Disc. Spine. 1989;14(2):166–174. 7. Roberts S, Evans H, Trivedi J, Menage J. Histology and pathology of the human intervertebral disc. J Bone Joint Surg Am. 2006;88(suppl 2):10–14. 8. Eyre DR, Muir H. Types I and II collagens in intervertebral disc. Interchanging radial distributions in annulus fibrosus. Bio- chem J. 1976;157(1):267–270. 9. Erwin WM, Islam D, Inman RD, Fehlings MG, Tsui FW. Notochordal cells protect nucleus pulposus cells from degra- dation and apoptosis: implications for the mechanisms of intervertebral disc degeneration. Arthritis Res Ther. 2011;13(6): R215. 10. Fardon DF, Williams AL, Dohring EJ, Murtagh FR, Gabriel Rothman SL, Sze GK. Lumbar disc nomenclature: version 2.0: recommendations of the combined task forces of the North American Spine Society, the American Society of Spine Radiology and the American Society of Neuroradiology. Spine J. 2014;14(11):2525–2545. 11. Cummins J, Lurie JD, Tosteson TD, et al. Descriptive epidemi- ology and prior healthcare utilization of patients in the Spine Patient Outcomes Research Trial’s (SPORT) three observatio- nal cohorts: disc herniation, spinal stenosis, and degenerative spondylolisthesis. Spine. 2006;31(7):806–814. 12. Weiler C, Lopez-Ramos M, Mayer HM, et al. Histological analysis of surgical lumbar intervertebral disc tissue provides evidence for an association between disc degeneration and increased body mass index. BMC Res Notes. 2011;4(4):497. 13. Shiri R, Lallukka T, Karppinen J, Viikari-Juntura E. Obesity as a risk factor for sciatica: a meta-analysis. Am J Epidemiol. 2014;179(8):929–937. 14. Mobbs RJ, Newcombe RL, Chandran KN. Lumbar discectomy and the diabetic patient: incidence and outcome. J Clin Neuro- sci. 2001;8(1):10–13. 15. Jordan J, Konstantinou K, O’Dowd J. Herniated lumbar disc. BMJ Clin Evid. 2009;3(3):1118. 16. Seidler A, Bergmann A, Jager M, et al. Cumulative occupa- tional lumbar load and lumbar disc disease—results of a German multi-center case–control study (EPILIFT). BMC Mus- culoskelet Disord. 2009;10(1):48. 17. Palmer KT, Griffin M, Ntani G, et al. Professional driving and prolapsed lumbar intervertebral disc diagnosed by magnetic resonance imaging: a case–control study. Scand J Work Environ Health. 2012;38(6):577–581. 18. Battie MC, Videman T, Kaprio J, et al. The twin spine study: contributions to a changing view of disc degeneration. Spine J. 2009;9(1):47–59. 19. Zhang YG, Sun Z, Zhang Z, Liu J, Guo X. Risk factors for lumbar intervertebral disc herniation in Chinese population: a case–control study. Spine. 2009;34(25):E918–E922. 20. Higashino K, Matsui Y, Yagi S, et al. The alpha2 type IX collagen tryptophan polymorphism is associated with the severity of disc degeneration in younger patients with herni- ated nucleus pulposus of the lumbar spine. Int Orthop. 2007;31 (1):107–111. 21. Kawaguchi S, Yamashita T, Yokogushi K, Murakami T, Ohwada O, Sato N. Immunophenotypic analysis of the inflammatory infiltrates in herniated intervertebral discs. Spine. 2001;26(11):1209–1214. 22. Zhou G, Dai L, Jiang X, et al. Effects of human midkine on spontaneous resorption of herniated intervertebral discs. Int Orthop. 2010;34(1):103–108. 23. Doita M, Kanatani T, Harada T, Mizuno K. Immunohistologic study of the ruptured intervertebral disc of the lumbar spine. Spine. 1996;21(2):235–241. 24. Roberts S, Evans H, Menage J, et al. TNFalpha-stimulated gene product (TSG-6) and its binding protein, IalphaI, in the human intervertebral disc: new molecules for the disc. Eur Spine J. 2005;14(1):36–42. 25. Andrade P, Visser-Vandewalle V, Philippens M, et al. Tumor necrosis factor-alpha levels correlate with postoperative pain severity in lumbar disc hernia patients: opposite clinical effects between tumor necrosis factor receptor 1 and 2. Pain. 2011;152(11):2645–2652. 27. Cribb GL, Jaffray DC, Cassar-Pullicino VN. Observations on the natural history of massive lumbar disc herniation. 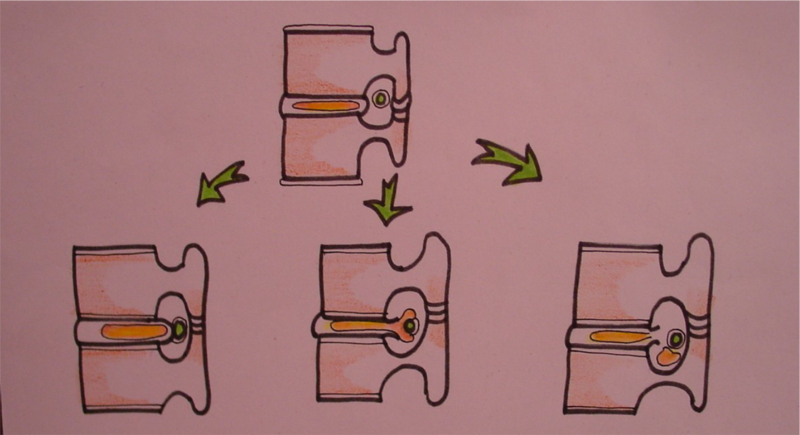 J Bone Joint Surg Br 2007; 89: 782–4. 28. Weinstein JN, Tosteson TD, Lurie JD, Tosteson AN, Hanscom B, Skinner JS et al. Surgical vs nonoperative treatment for lumbar disk herniation: the Spine Patient Outcomes Research Trial (SPORT): a randomized trial. JAMA 2006; 296: 2441–50. 30. Roelofs PD, Deyo RA, Koes BW, Scholten RJ, van Tulder MW. Non-steroidal anti-inflammatory drugs for low back pain. Cochrane Database Syst Rev. 2008(1):CD000396. 31. Eskin B, Shih RD, Fiesseler FW, et al. Prednisone for emer- gency department low back pain: a randomized controlled trial. J Emerg Med. 2014;47(1):65–70. 32. Yildirim K, Deniz O, Gureser G, et al. Gabapentin monother- apy in patients with chronic radiculopathy: the efficacy and impact on life quality. J Back Musculoskelet Rehabil. 2009;22(1): 17–20. 33. Assendelft WJ, Morton SC, Yu EI, Suttorp MJ, Shekelle PG. Spinal manipulative therapy for low back pain. A meta- analysis of effectiveness relative to other therapies. Ann Intern Med. 2003;138(11):871–881. 34. Rubinstein SM, van Middelkoop M, Assendelft WJ, de Boer MR, van Tulder MW. Spinal manipulative therapy for chronic low- back pain: an update of a Cochrane review. Spine. 2011;36(13): E825–E846. 35. Rubinstein SM, Terwee CB, Assendelft WJ, de Boer MR, van Tulder MW. Spinal manipulative therapy for acute low back pain: an update of the cochrane review. Spine. 2013;38(3):E158–E177. 36. Saal JS, Franson RC, Dobrow R, Saal JA, White AH, Goldthwaite N. High levels of inflammatory phospholipase A2 activity in lumbar disc herniations. Spine. 1990;15(7): 674–678. 37. Schaufele MK, Hatch L, Jones W. Interlaminar versus trans- foraminal epidural injections for the treatment of sympto- matic lumbar intervertebral disc herniations. Pain Physician. 2006;9(4):361–366. 38. Walker JL, Schulak D, Murtagh R. Midline disc herniations of the lumbar spine. South Med J. 1993;86:13–17. 39. Jacobs WC, van Tulder M, Arts M, Rubinstein SM, van Middelkoop M, Ostelo R, Verhagen A, Koes B, Peul WC. Surgery versus conservative management of sciatica due to a lumbar herniated disc: a systematic review. Eur Spine J. 2011 Apr;20(4):513-22. 40. Spengler M, Ouellette EA, Batti M, Zeh J. Elective discectomy for herniation of lumbar disc. Additional experience with an objective method. J Bone Joint Surg (Am) 1990; 72 (2): 230-7. 41. Rainville J, Lopez E. Comparison of radicular symp- toms caused by lumbar disc herniation and lumbar spinal stenosis in the elderly. Spine (Phila Pa 1976) 2013;38:1282-7. 42. Goldner JL: The role of spine fusion: question 6. Spine 6:293, 1981. 43. Frymoyer JW, Hanley E, Howe J, Kuhlmann D, Matteri R. Disc excision and spine fusion in the management of lumbar disc disease. A minimum ten-year followup. Spine (Phila Pa 1976). 1978 Mar;3(1):1-6. 44. Glassman SD, Carreon LY, Ghogawala Z, Foley KT, McGirt MJ, Asher AL. Benefit of Transforaminal Lumbar Interbody Fusion vs Posterolateral Spinal Fusion in Lumbar Spine Disorders: A Propensity-Matched Analysis From the National Neurosurgical Quality and Outcomes Database Registry. Neurosurgery. 2016 Sep;79(3):397-405. How to Cite this article: Gadiya A, Borde M, Patel P, Bhojraj S, Nagad P, Prabhoo T. Lumbar Prolapsed intervertebral Disc – A treatment algorithm. Journal of Clinical Orthopaedics July – Dec 2016; 1(1):29-35..